The DOW is the only index that has not broken out. Apparently the DOW (multi-nationals) is hampered by the constant threat of a blown out trade war. In order for the DOW to breakout the range, it needs to close above the 25800 resistance level. 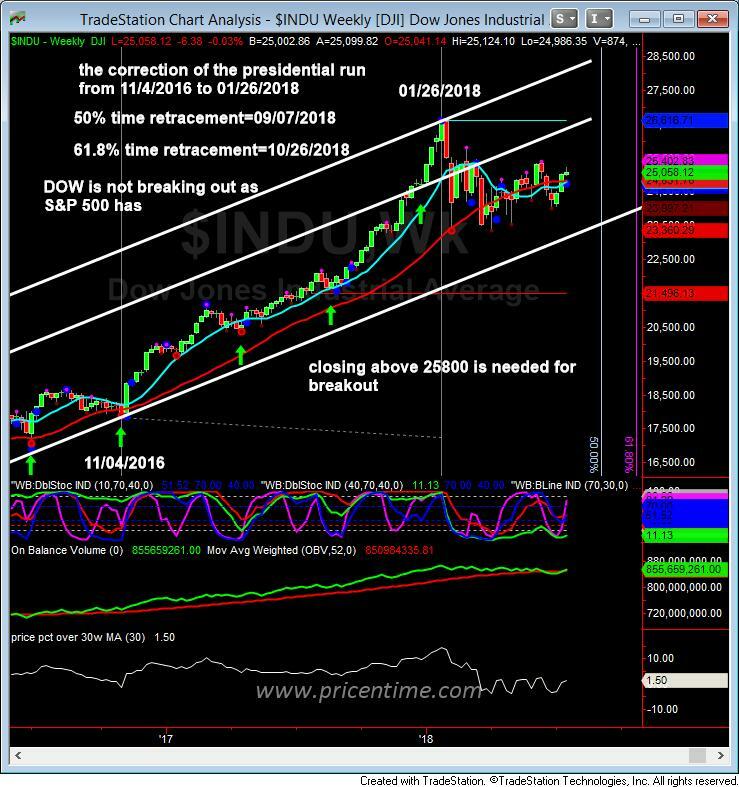 The 50% time retracement of the presidential run that started on 11/04/2016 and finished on 01/26/2018 is 09/07/2018, and the 61.8% time retracement is 10/26/2018. Most likely between now and September/October the DOW will be trapped under 25800 and it will have one more selloff before it takes off again. The small cap index has been considered safe in the threat of a real or imagined trade war. The investors have been willing to pay an absurd and ridiculous price for it. It has been rallying for the last five months straight. We believe the trade war will dissipate by September/October as the mid-term election nears. The political forces at work will simply not allow the trade war to hurt their election. When the time comes, the market will undergo a massive rotation. Money will flow out from the small caps and into mega caps again. So it you have holdings in small caps, it is prudent to take profit before the rotation in September/October time frame. It is not sustainable to have the small cap as the market leader. Small cap is not blue chip, it is of speculative nature. The DOW is in the 15th weekly bar in this current weekly cycle. It will probably stay up till the end of July and then starts a slow selloff again to make a weekly cycle low around the September/October time frame. The fundamentals are sound and the money is still there for the market to run. The yield curve is flattening, but has not inverted yet. Even when the yield curve inverts, the market can still rise about 21% over 18.5 months from the date of inversion. So for us the primary fundamental indicator is the yield curve and it is still positive for the market. Based on our studies on the presidential cycle, the third year of the first term is the best year for the stock market. The administration will do whatever to make the voters feel good about the economy for the sole purpose of re-election. 2019 will be a great year followed by a good year 2020 as well. So if you have long term holdings, please don’t be affected by the constant noises. The longest bull market is far from over. The US listed Chinese growth stocks have been dragged into the currency war. These growth stocks are not affected by the trade war as they simply serve the domestic Chinese population. But the sentiment around the currency war definitely hurts. We remain bullish long term with the Chinese growth stocks and will be willing to weather the short term volatility. This entry was posted	on Sunday, July 22nd, 2018 at 8:42 pm	and is filed under Forecasts, Stock Indices. You can follow any responses to this entry through the RSS 2.0 feed. Both comments and pings are currently closed.